MAPS (Monitoring Avian Productivity and Survivorship) is an international program coordinated by the Institute for Bird Populations to monitor the status of population trends in breeding birds throughout North America. Over 500 MAPS stations from North, Central and South America contribute data annually to the Institute for Bird Populations database. 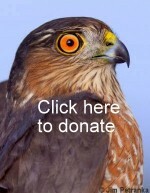 Southern Appalachian Raptor Research (SARR) operates four MAPS stations – Big Bald Banding Station on the Cherokee National Forest in Unicoi County, TN; Cowee Mound in Macon County, NC; Welch Farm in Cherokee County, NC; and Kituah Mound in Swain County, NC. Support for MAPS stations are funded through grants from the Cherokee Preservation Foundation and Mainspring Conservation Trust. MAPS samples are conducted approximately once every ten days, from sunrise to noon, during the late spring and early summer. Volunteers and visitors are welcome to attend and contribute in any way possible, no matter their experience level. Visitors or helpers can arrive at any time during the sample morning and can participate for any length of time. Please check the SARR website calendar for the 2019 MAPS schedule. The schedule may change due to weather considerations. Groups desiring a formal education visit during MAPS are encouraged and welcome! Please contact SARR via email to arrange a date and program. To view annual 2018 MAPS species list data from any SARR MAPS station click on the links below. To view annual totals of capture and recapture for each MAPS station, click on the images below.